The Difficult Second Movie: STAR WARS EPISODE II - ATTACK OF THE CLONES | Warped Factor - Words in the Key of Geek. Star Wars Episode I: The Phantom Menace was, prior to release, probably the most eagerly anticipated movie of all time. I sat there on opening day with my jaw dropped. Here was new Star Wars, with new Jedi with lightsabers battling futuristic creatures that my imagination would struggle to even visualise in my mind's eye. After the film ended I walked out the theater, not in disgust at Jar Jar or L'il Annie's superpowers but amazed at what I'd witnessed. A brand new Star Wars film and a technological leap in cinema. It's fair to say that the response from critics and fans was mixed, at best, and I admit that after multiple viewings, after reading multiple critiques, and after the shiny newness of The Phantom Menace wore off, I started to agree with the masses. Not that The Phantom Menace was terrible, but just, story wise, it wasn't that great. It is a flawed movie which is too bogged down in political dealings, and suffers, in retrospect, from being not that vital to the overall story-arc presented across the first six movies. Saying that, I still think it's a worthwhile watch as it features some great set-pieces (pod racing), action sequences (Darth Maul showdown), and Liam Neeson who is particularly great, but it could've been so much better. George Lucas had a huge job on his hands. The internet exploded whilst the Prequel Trilogy was in production and fans were taking him to task for every single mistake he made in The Phantom Menace. No longer was it just a handful of movie critics with a voice, now everyone everywhere had their say, and say it they did. But here's the thing, when it came to Episode II George listened. He really did. And, whilst not perfect, the difficult second installment turned out to be the best of the three Prequel films. Set ten years after the Battle of Naboo, when the galaxy is on the brink of civil war, Attack Of The Clones introduces renegade Jedi Master Count Dooku. Under his leadership thousands of systems threaten to secede from the Republic. When an assassination attempt is made on Senator Padme Amidala, the former Queen of Naboo. Jedi apprentice Anakin Skywalker is assigned to protect her, while his mentor Obi-Wan Kenobi is assigned to investigate the assassination attempt. Soon the Jedi, Anakin, Padme and Obi-Wan are drawn into the heart of the separatist movement, and the beginning of a new threat to the galaxy: the Clone Wars. Attack Of The Clones is fast paced, and it has to be as there's a lot to fit in to the 2 hours and 22 minutes, but it flows very well, and all round feels much better paced than the first film. It's a more intense adventure. The thrills are much more awesome. The action is more incredible, take the dizzying chase through Coruscant on airspeeders for example, and there are more lightsaber duels and big battles. 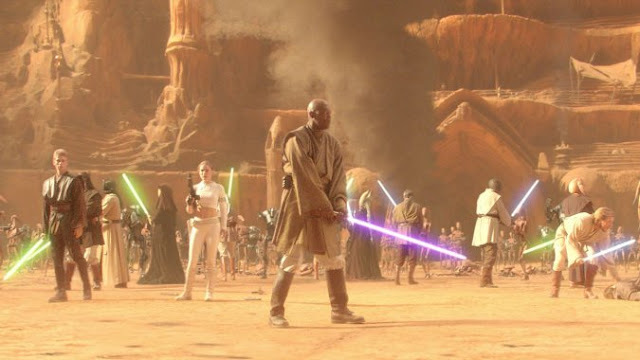 The fight between the Jedi and the Droids on the planet Geonosis is one of the highlights of the entire saga, along with the final fight between Obi-Wan, Anakin, Yoda and Count Dooku. There really is more of everything in Attack Of The Clones, including CGI, which, and I know I'm likely in the minority, doesn't worry me a bit. It just helps with bringing all the fantastical worlds, characters and scenarios to life that just wouldn't be possible any other way. Certainly not to the degree presented here, that's for sure. Every location in the movie, from the metropolis skyscrapers of Coruscant to Kamino the water planet where the clone army, the prototypes of Stormtroopers, are being constructed literally bursts with imagination. Fantastic, unique set design. Oh, there is one area where there is less - less Jar Jar Binks. Thank you George. From an acting perspective, Attack Of The Clones does wonders. Ewan McGregor returns as Jedi Master Obi-Wan Kenobi and he does an incredible job this time around. He exudes an aura of wisened Jedi, he's so well traveled and carries many a moment in the film, always leaving you wanting more screen time with him. Natalie Portman returns as Padme Amidala and I think she's really good in both the romantic and non-romantic scenes, the aforementioned fight on Geonosis for example. 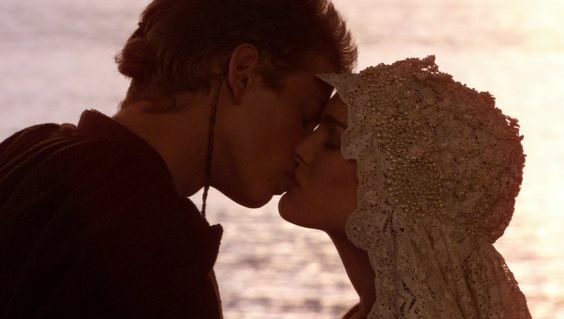 I don't think Hayden Christensen is as bad as everyone makes him out to be, he has some awkward romantic moments with Portman, but in most of the action scenes he's pretty good. I think people forget he's playing a 19 year old wannabe Jedi packed full of raging hormones. His performance reflects that, so if anyone's to blame for his awkward dialogue then it's Lucas. George is a brilliant science fiction movie maker but can't write romance for toffee. The secondary characters are interesting and well played, and we get some history on Boba Fett and the Lars connection. On top of all that, there's Christopher Lee as Count Dooku. That bit of casting was brilliant. Lee portrays Dooku sort of like a space version of his Dracula character from his Hammer Horror days. Genius at work. Unlike The Phantom Menace I've never lost my love for Attack Of The Clones, not one little bit. As I said I think it's the best of the Prequel Trilogy and I actually prefer it to Return Of The Jedi. The Prequel Trilogy was always going to be a difficult story to tell successfully as we already know what happens to the characters. The Phantom Menace was, sadly, unnecessary, Revenge Of The Sith tells little more than the inevitable, but Attack Of The Clones gives us an adventure. It delivers exactly what we expect from a Star Wars film; absolutely stunning visual effects, fantastic cast, great story, and more fun than should be legal in 144 minutes.